Diane Lane in 'Hollywoodland' Actress Diane Lane co-stars with Adrian Brody, Ben Affleck and Bob Hoskins in the new film Hollywoodland. The film is based on the real-life mystery surrounding the death of actor George Reeves, who played Superman on TV. 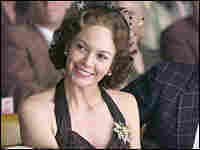 Actress Diane Lane co-stars with Adrian Brody, Ben Affleck and Bob Hoskins in the new film Hollywoodland. The film is based on the real-life mystery surrounding the death of actor George Reeves, who played Superman on TV.